Every dog owner will tell you, that no matter how hard you try, your four-legged friend comes with their very own distinct odour to your home. Whether it’s a bad smell or just a “doggy” smell, sometimes it’s unavoidable. Before we even talk about pet accidents, a normal lingering dog odour smells like wet wool or like a pond – as my mother says. And once you smell it, it’s unlikely you will forget about it. This smell can easily cling to carpets, upholstery, rugs and curtains in your home. Even if you bathe and groom your dog on a regular basis, this smell can continue to linger around the home. Thankfully, removing dog smells from your carpet is quite an easy procedure. 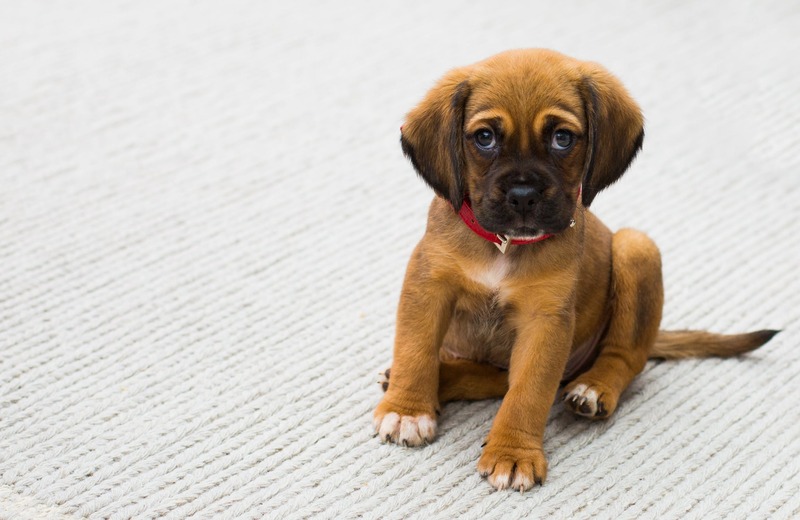 Follow this quick and easy guide to learn the best ways of protecting your carpets from your furry friends. If you can’t find a shop bought product that you like, you can always make your own dog odour neutraliser at home from a popular kitchen item – baking soda! Although, you will need to be very careful as large amounts of baking soda can be toxic to dogs and other pets so make sure your loved ones are away from the area whilst your cleaning. If the baking soda technique or shop bought pet odour neutraliser doesn’t do the job, you can always hire a professional carpet cleaning company for the job. 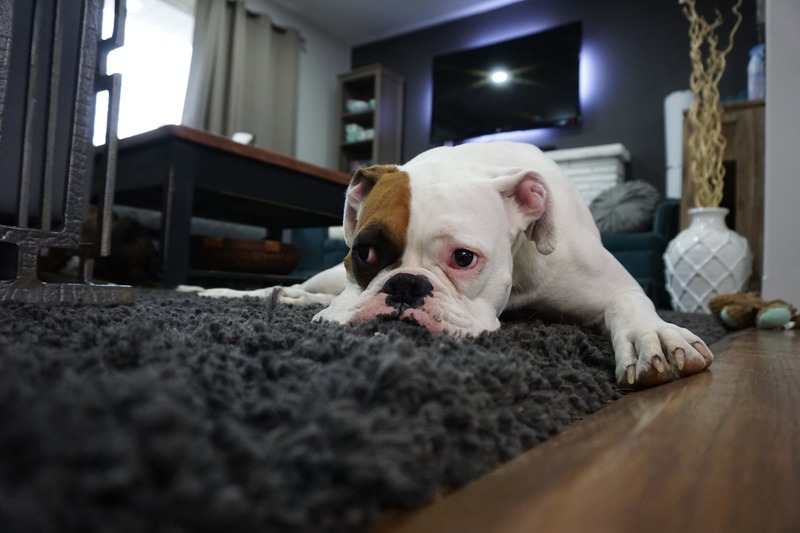 Professional carpet cleaning companies will use a hot water extraction cleaning process that will extract any dog odours, contaminants and other pollutants from your carpet. Every dog owner will be used to it by now. You come back from a full days work, walk through the door and that pungent smell hits your nostrils at full force! After a little investigation its clear to see that our four-legged friend has left you a little present on the carpet. If you’re not quick about moving spots and stains from carpets, the stain can get worse and make it much harder to remove. To make things worse, you can even impact the stain further in to the carpet pile if you’re not careful. If you treat the stain correctly and act quickly, the more likely you will be able to remove that stain completely without needing to hire a professional carpet cleaner. Surprisingly enough, solids are easier to deal with than removing urine or vomit from your carpets. That of course, all depends on how deep the poop has gone in to your carpet fibre of course. Removing dog poo from your carpets may take a couple of attempts but if you follow the steps below you should be able to completely eradicate any soiling. After you have done this a couple of times the soiling should be gone from your carpet. When your dog pees on the carpet, the worst thing you can do is use a steam cleaner to clean the area. Steam cleaning will only set the urine stain in to the carpet and you will have that pungent ammonia smell in your house forever. The main thing that you need to consider is whether the urine stain is fresh or dried. The reason being is that there are 2 different cleaning methods you should use for each. Repeat the above process to soak up the water with towels until the stain has gone. If the urine has dried, it starts to get a bit more difficult. Although still possible to completely remove dry urine from a carpet this cleaning process can be a bit more problematic. Check if the urine has soaked through to the underlay of your carpet. If it has, you may need to replace this carpet altogether or face a lingering urine smell until your carpet is replaced. Ensure your dog is kept away from the soiled area and can’t access it whiles you are treating it. Apply plain white vinegar to the stain, and wearing rubber gloves, gently rub it in to the fibres of the carpet with your fingers. Leave the vinegar to sit overnight and then sprinkle the area with some baking soda. Leave the powder for a few hours and then vacuum the area completely. Repeat this process a few times to remove the staining and finally use a wet vac to extract any left over cleaning residue in your carpet. Note: Depending on how bad the urine stain is, you may need to hire a professional. This is a DIY tip and may not perform the optimum results. Removing dog vomit from your carpet can be a daunting task, but if you know what you’re doing it doesn’t need to be so difficult. Follow the steps below to remove dog vomit from your carpets easily. Put on rubber gloves. This not only keeps your hands away from the unpleasant substance, but also protects you from germs and bacteria. Use a scraper to scrape off as much excess vomit as possible. At this point you just want scrape up any larger solids leaving the carpet with just the stain remaining. Ensure your dog is somewhere safe and cant access the spot you are treating. It’s time to reach for the good old baking soda again. Pour baking soda on the affected areas in the carpet and leave for about 30-60 mins. Once the area has dried completely, vacuum all the excess baking soda and remaining vomit. Now get some club soda and pour on the vomit stain, dab a rag on the stain and blot until all the moisture is removed. Repeat this process until the stain is removed. Finally dab and blot with lukewarm water and towel dry. Firstly, I would like to thank Alan Davis of AAAClean.co.uk for his input towards this article and providing me with the DIY stain removal techniques needed to remove all types of dog odours from your carpets. I think it’s clear to see that the key to clearing up most stains after your pet dog is to think on your feet quickly. Stains are easiest to remove from your carpets when they fresh, so the quicker you act the more likely you will be able to carry out DIY stain removal on your carpet with success.